The No. 800 1953 Studebaker " BAD ATTISTUDE"
A number of customers expressed interest in the Studebaker and requested I post photos and info to the web site. In response I've started this page and those that follow . 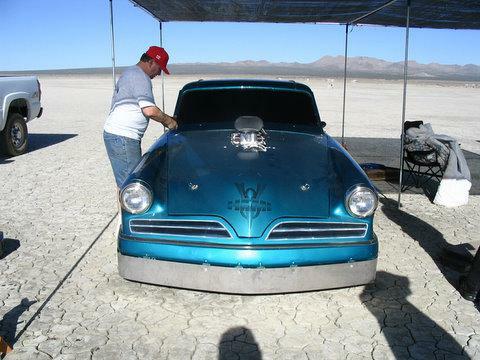 The 1953 Studebaker was purchased from Tom and Margie Price " The Wild Bunch Racing Team" in 1999. The car was taken to Mike Cook Motorsports to get the chassis race ready and a new paint job. 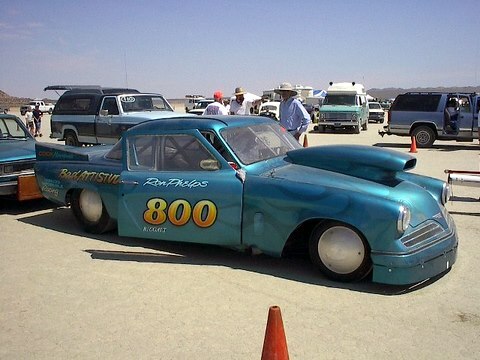 She made her debut at the SCTA September 2000 El Mirage Dry Lake timing trials. The car was ill handling with the rear end moving from side to side. I lived with that contributing it to course break down through the first few years running at El Mirage. 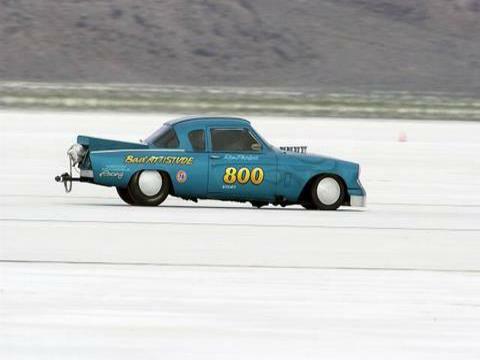 Best speed on the Dry Lake was 178 mph against a 205 mph record. In late 2002 Dan Hart teamed up and working out of his garage we replaced the Chrysler four speed overdrive unit that could not take the torque that the engine was putting out with a Chevy turbo 400 automatic race prepped at Mike's Transmissions. I purchased a set of Good Year landspeed tires from Carol Shelby Enterprises and that took care of the handlng problems. 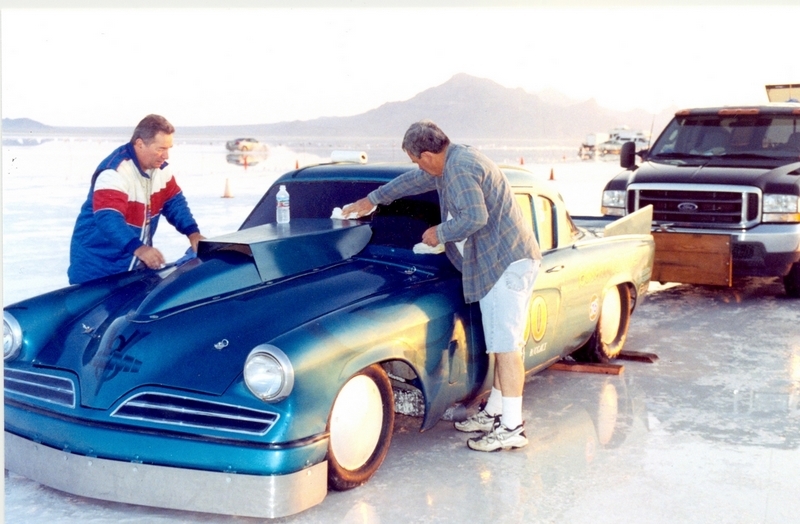 The car managed a 185.737 mph best at Bonneville for the August Speed Week 2003. This was our first time on the salt and it was a memorable learning experience. The speed was a little disappointing, bad weather prevented further runs. 2004 Bonneville Speed Week morning car prep. Dan Hart (right) and myself (on the left) in my fire suit getting the car ready for a run at the 2004 Bonneville Speed Week. Water on the Salt forced the event crew to move the course about a mile down from the original course. I managed a 196.847 mph run on Tuesday August 17, 2004 and Dan turned a 204.689 mph run on Thursday August 19, 2004. Even though the performance had improved it was still far from being competitive. Dan wanted to put his Supercharged Donovan Hemi in the car running Nitro Methane which we undertook when the car was brought back from Bonneville. We removed the 426 ci Hemi from the car in September 2004 and had the Donovan installed and fired up fot the November 2005 El Mirage Dry Lake meet. The Donovan was bored and stroked to 468 ci equipped with an 871 supercharger with a Crower eight port fuel injection system. Dan started out on what looked to be a very good run, however mechanical problems did not allow the car to make a full pass. Dan pulled off the course about 1000 ft into the run, visual inspection found some rods had come out of the block and further tear down found a cracked block and broken cam shaft. Dan ended his partnership after that and I decided to rebuild the car and run it in a fuel class. The rebuild story, photos and a history of the Studebaker will follow. At the July 2002 El Mirage Dry Lakes meet, a friend of mine shot this video of the Studebaker making a pass. The car was ill handling to begin with and being late in the day the course was pretty well chewed up from the previous runs. I apologize for the poor quality.